So, you (or your volunteers) have done research and prepared a talk. Now it's important your presenting style doesn’t let you down. Always keep your audience in mind, as they should influence your style. Talking, as I and my St Columba's Hospice volunteers do, to an audience of school children brings additional challenges, not only because we're dealing with a difficult subject, but because their level of interest may be variable; they did not necessarily choose to come to the talk. While it can be tempting to talk down to children, this is unnecessary. It is more important to capture their attention with graphic description and examples. So, when describing the hospice, we talk through a tour of the building rather than simply stating facts. All of our volunteers have a personal connection with the organisation and I encourage them to bring this into their talk. It can provide a good lead into more general factual information and gives authority and relevance to what they say. It's important to strike a conversational tone, as volunteers speaking to groups are often not teachers or lecturers and should try not to come across as such. Because of this, I believe visual aids should be avoided. Unless you're discussing, for example, aid projects or the progress of new buildings, where photographs are demonstrating progress or putting a human face to your work, slides won't necessarily add to what you're saying. It comes back to putting your audience first: are the slides for their benefit or yours? And on a purely practical note, the less you have to worry about loading slides or connecting up laptops, the better. If your talk is based on a slide show and you have technical problems, it will be significantly harder to deliver. Many inexperienced presenters make the mistake, quite understandably, of imitating the style of someone they admire or think presents in an interesting way. Trying to be someone else will always sound unnatural and the goal should be to come across as relaxed and confident of what is being said. If a speaker is genuine and (more importantly) enthusiastic, then the audience will trust them. If they appear hesitant, why should the audience perceive them as credible? Confidence and authority are important in every speaking situation. 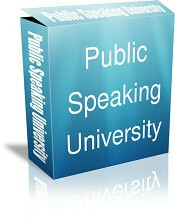 If you have prepared well, then you have no need to appear timid when you speak. At the end of a talk, it's usual to invite questions. This can lead to one of two potential nightmare situations: complete silence when ten minutes has been allowed for lively discussion or the unanswerable question. In the case of the no-question scenario, there are a couple of options: have a plant in the audience or say something like, "I'm often asked …". Usually, the reason for silence is that most of us are afraid to ask the first question, for fear of looking foolish. If a speaker can break the ice, then more questions will follow. Depending on the size and make-up of the group, another option is to turn it around and ask them a question to get the discussion going – but this can be risky if you don’t know the audience, as you might not get the answer you expect. In the case of the unanswerable question, it is perfectly alright to say that you don't know – as long as you undertake to find out. Responding "Haven’t a clue," isn't acceptable (and I have known people to do this) whereas "I'd have to check and get back to you" is absolutely fine. It's common sense, but performance nerves might make us forget!